Forging(Hada): Forging is fine Ko-Itame-hada, mixing in fine Mokume burl. The entire hiraji-surface is covered in speckled Ji-nie that generates reflecting irregular whitish Midare-Utsuri effect over the surface. Temper(Hamon): Hamon is Nie hard metal granules base, An awfully flamboyant undulating GUNOME mixing in small clove out line of Choji-ha and pointed head of Togari-ha quench pattern where works with deep sparkling-Nie and deep "Noi" mist-like crystalline area. Some isolated temper splashes over the surface to generate "YUBASHIRI" indication. In the interior of temper, there works with frequent "Kinsen" bright curved threadlike areas and "Sunagashi" short lines of Nie. Temper of tip(Boshi): Boshi forms irregular "Midarekomi" indication. Tang(Nakago): Nakago is in UBU original. Two peg retaining holes. Katte-sagari (slanting left) filemarks. Back ridge of Nakago is flat. The Nakago is relatively short for it's long cutting edge, single-bevelled heel mark so called "Ha- agariKURIJIRI". Although some of inscriptions are a bit indistinct due to passage of 500 years more, the signature in front is recognaized Bishu-Osafune NORIMITSU 備州長船法光 and the other side is inscribed with the date of year In the 2nd month Eisho 6 永正六年二月日. Powerful clans or generals from the disturbance period of Waring States Period to the Azuchi Momoyama state required the rich, massive volume and thick in kasane with high shinogi-ridge, with well-proportioned deep curve. 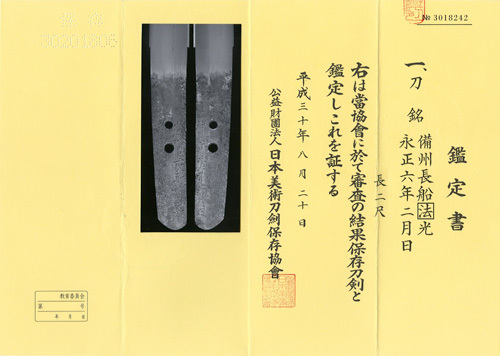 Among Japanese sword makers in Bizen province, so called Sue Bizen 末備前, sometimes called Eisho Bizen 永正備前 covers Bizen swords in Koto on after Eisho before Bunroku (ca.1504 - 95). Katsumitsu 勝光, Tadamitsu 忠光, Munemitsu 宗光, Kiyomitsu 清光, Sukesada 祐定, Sukemitsu 祐光, Norimitsu 則光 or Norimitsu 法光 were the most distinguished sword makers. The subject sword is deep in curve which was designed for fast draw out from scabbard and suitable length for one hand battle swordsmanship. Extremely strengthened construction of high shinogi-suji ridge with rich volume of Hiraji which was made for supreme sharp cutting performance in full of a brave Samurai spirit from the Warning States period. Durable Ko-Itame wooden structure forging using super fine steel with rather on harder side temper quenching with defused reflection of steel "Utsuri" as well as flamboyant Hamon presents amazing grand sight. Although some inscription is a bit indistinct, this katana presents typical workmanship of NORIMITSU 法光 which is massively heavy on hand holding in very good condition after passage 510 years or more. Silver foiled Habaki collar, preserved in a Shirasaya plain wood mounting.